Olivia has just turned 2, and she’s already so receptive to other people’s emotions. She has been from a very young age. If she sees or hears a baby crying, she goes over to them and tries to comfort them in her own adorable way. She understands that certain things make mummy sad or happy, and she tells me when she is sad or when she is happy. I honestly don’t believe we would be at this stage if she hadn’t ever seen me cry (on numerous occasions). I want her to know that it’s okay to cry, and that she should never feel ashamed of crying. Crying doesn’t make you weak, it makes you strong. You’re releasing a lot of emotion in the only way you can, and if you didn’t release it, you’d be worse off. You would bottle it up and the upset would turn into anger. I’m okay with Olivia seeing me upset. There are many, many times when I’m upset because of Olivia. Maybe it’s sleep deprivation or just a general feeling that I can’t cope anymore on my own with her because I’ve had a whole day of her shouting “No!” at me and throwing herself around in a tantrum on the floor. It’s those times that I think it’s most important that she sees me crying – when it gets to that point. 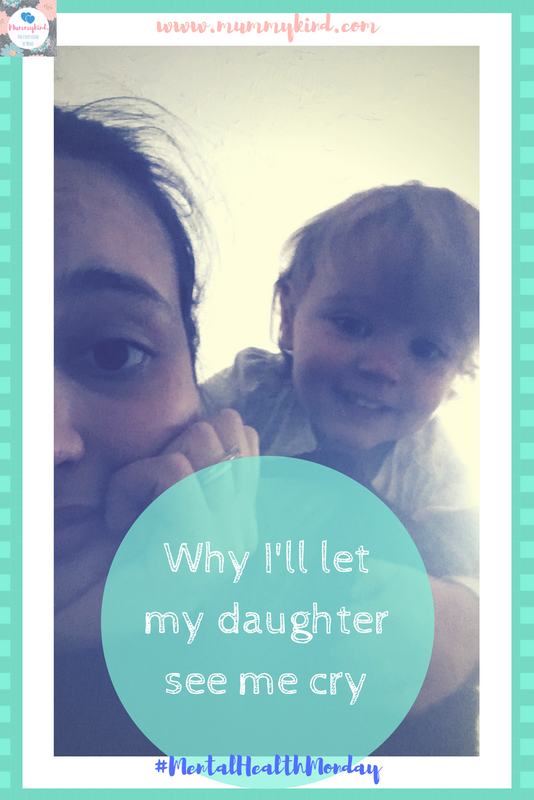 I don’t want my daughter to grow up thinking that there are no consequences for her actions. There are certain things she will do that will upset the people around her, and every time she sees me crying, it immediately stops her from doing whatever it was that drove me to tears in the first place, and she comes and gives me a “cug” and we both feel better afterwards. I want Olivia to grow up to be kind and nurturing, and learning to comfort others is a huge part of that! If I had a son, I would do exactly the same with him. It’s even more crucial to help boys learn that crying is okay and that they don’t have to bottle up their tears. In the UK, mens’ suicide rates are 3 times higher than women’s, and a huge part of this is the notion that boys and men can’t show emotion. Suicide remains the biggest killer in men aged 20-49, and yet an astonishing 34% of men said that they would feel ashamed or embarrassed to take time off work for their mental health, compared to 13% feeling embarrassed for time off for a physical injury (https://www.menshealthforum.org.uk/key-data-mental-health). Mental illness is seen as a weakness, more so amongst men than women. I would never, ever want my children to grow up seeing these indiscriminate and often debilitating illnesses as things that make them weak. Facing their illness head on, confronting their fears, and learning how to properly cope with emotions is the best strength that our children can learn from us parents who have unfortunately been there and well and truly got the damn t-shirt! My daughter will learn to show and cope with her emotions and to be supported, and my sons (if I ever had any) would learn the same. We all have them. Why should we hide?